Christmas is over, the decorations down, thoughts turn to summer weddings with bright sunny days, open sided marquees and fresh Delphiniums & Freesias. But, do all brides dream of a traditional summer wedding? Maybe not, take a look! Here at The Tea Set our main event catering is for weddings and usually these are in the summer, but sometimes, just occasionally we get asked to cater for a winter event. Surprisingly, this can still be a marquee, with just the addition of a space heater. It can also be held in a traditional village hall which can be completely personalised by you or your wedding planner. As you see above we went for a green theme with gorgeous flowers, fabulous vintage glassware and, of course, our very own beautiful, mismatched china, cutlery and linen. Traditional afternoon tea consists of delicate triangle sandwiches, scones with clotted cream and jam and mouthwatering sweet selection, this can still be the case for a winter wedding, but why not add in a 'hot' option? Mulled wine or cider? Or why not serve hot soup in teacups with mini rolls? If you have access to an oven you could even heat up the savoury tarts and scones! As this is probably the most important day of your lives to date, but you don't have the funds to splash out for a reception in a hotel, why not spend a little money and time on creating your own perfect day? 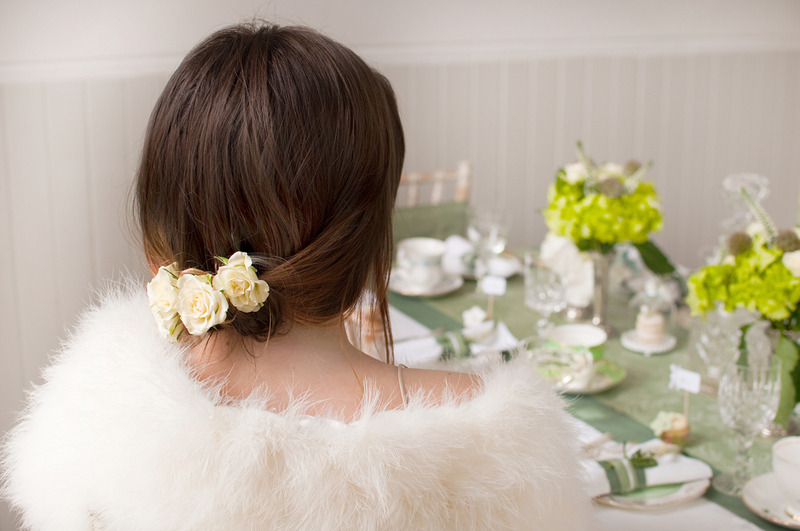 We used a stylist and photographer to create our beautiful setting, but you don't have to. Set up your own Pinterest board, add all your favourite images, pictures and photos, then gather inspiration and ideas and go for it!